Installation expense - running fiber from a providers regional IP backbone to a specific endpoint such as an office building is extremely expensive. It involves building permits, trenching the fiber, installing fiber multiplexing equipment, gaining permissions from building owners and others, as well as detailed engineering diagrams and public service works. 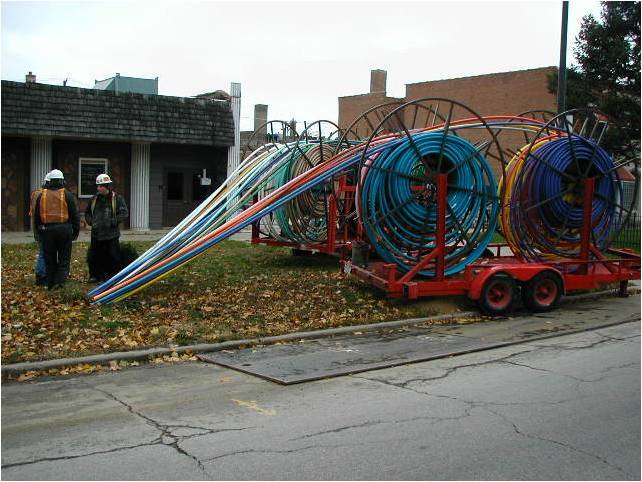 Customer interest - without knowing there are actually customers willing to buy the fiber Internet service that could be provisioned in a particular building, providers are hesitant to spend the large dollars required to install the service to begin with. By understanding specific customer needs within the building, how much bandwidth is required, what customer applications would benefit from fiber Internet provisioning, the chances that a provider will “light a building” are much better. The number of customers available in the building – obviously the more potential customers that are interested, the more likely a particular provider will light the building. Other factors - such as customers willingness to sign up for services ahead of time to justify lighting the building, educating customers about extended installation intervals involved with lighting the building, and numerous other considerations.